A creative company needs an innovative workspace. 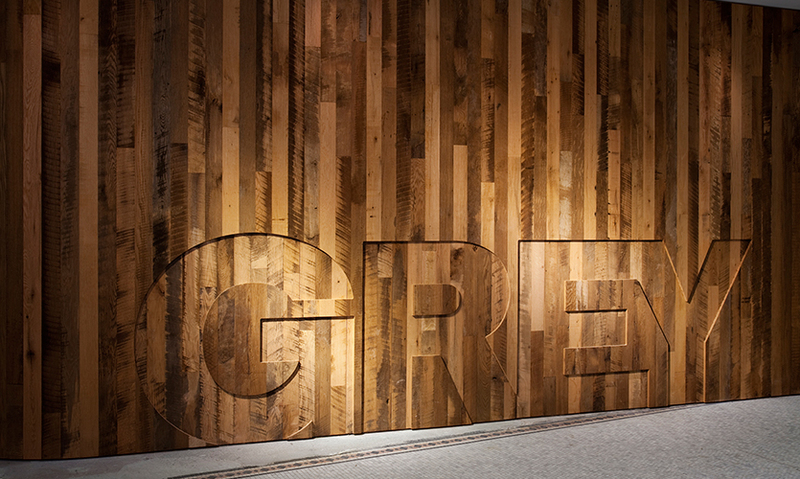 For Grey Group, one of the largest marketing communications companies in the world, a move to new, state-of-the-art headquarters in the former International Toy Center in the Flatiron District, a New York design hub, symbolized a renewed commitment to creativity. 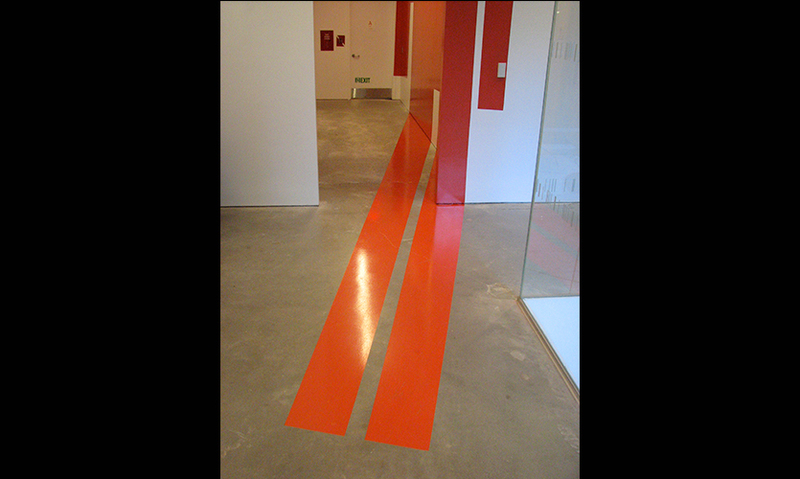 The designers developed an inventive program of environmental graphics for the offices. 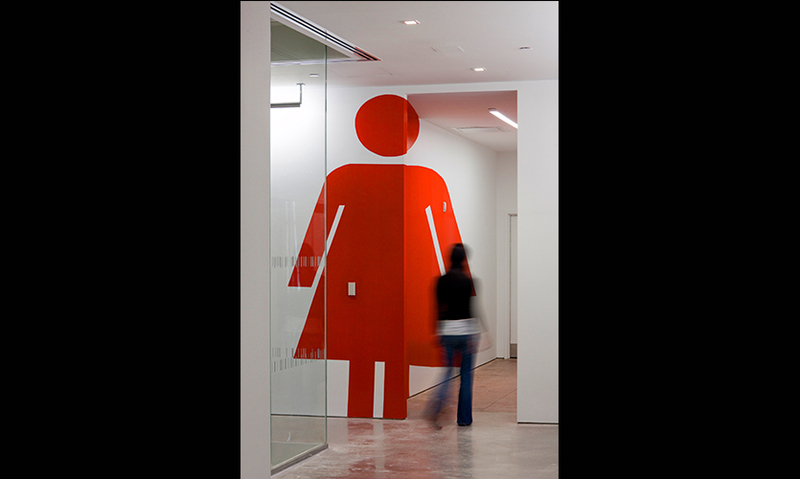 The graphically playful signage promotes the creativity of the company’s various divisions and at the same time ties the loft-like floors of the new headquarters together into a cohesive environment. The interiors were designed using different materials for each division or department on each floor. The environmental graphics use these same materials —wood, glass, metal and polymer—in ways that suggest the personalities of the different divisions. 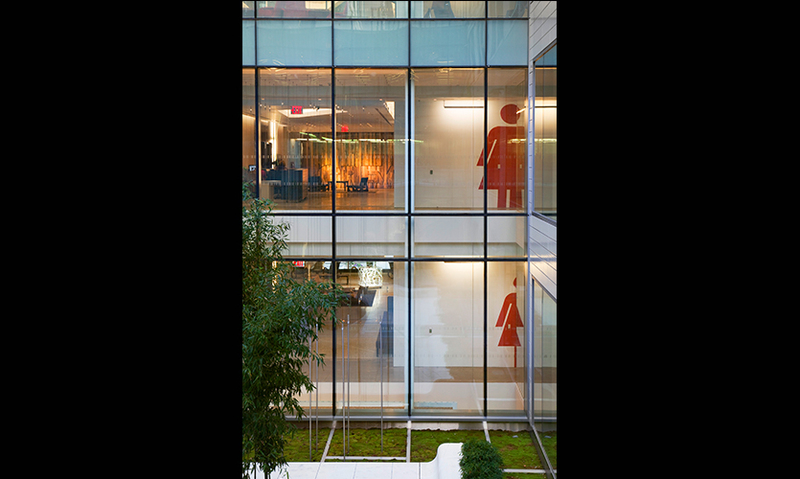 The signage mixes the materials with elements of reflection, transparency, lighting and pattern to create a series of optical illusions that sets each department apart. 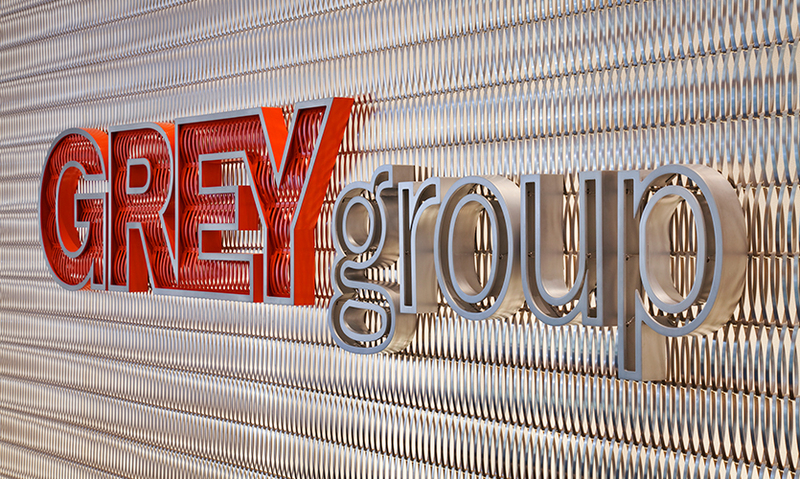 Visitors to the first floor lobby are greeted by a front desk backed by a dramatic wall of backlit metal mesh that features both the logos of Grey Group and G2 rendered in the same mesh. For the open, gallery-like spaces of the second and third floors, which contain Grey’s creative departments, the designers created large-scale installations that brand the agency in the space. The second floor features large windows on Madison Square Park and distressed elements like exposed brick that remain from the building’s previous incarnation. 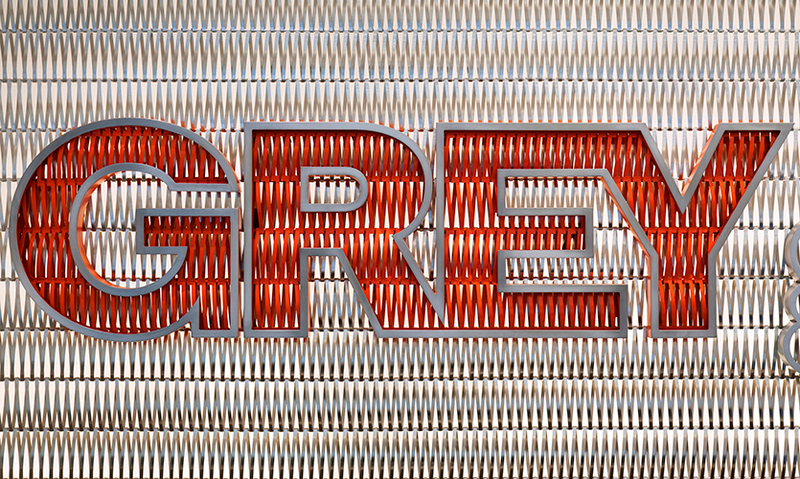 Here, the designers created a typographic sculpture with the Grey logo rendered in neon inside a clear 35-in. cube that sits on the floor like a piece of art. 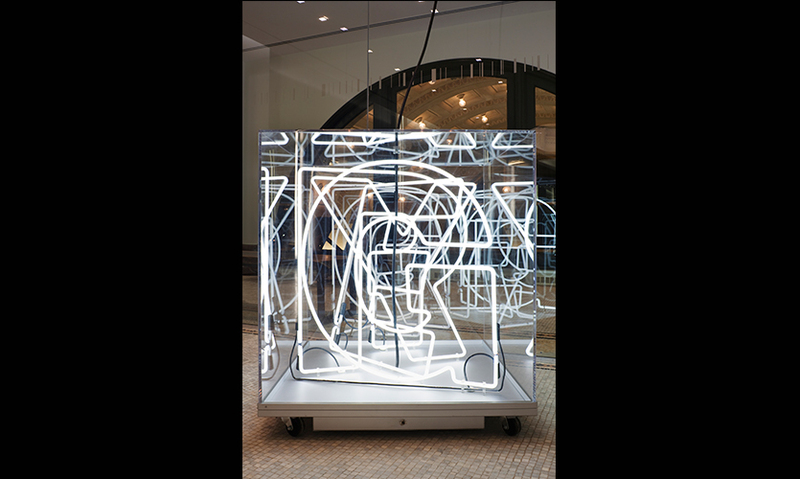 Surrounded by reflective glass, the cube activates the space. 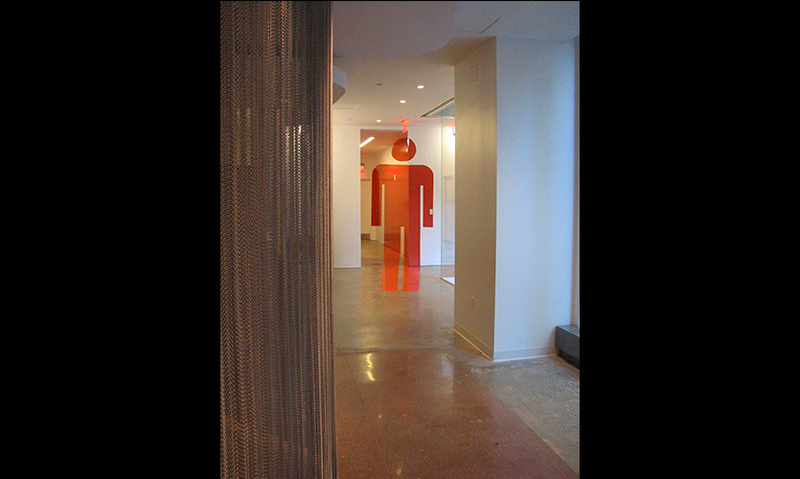 Restrooms on the second and third floors feature anamorphic, superscaled male and female icons that appear “correct” at their respective entrances but then graphically stretch down the halls.